Dual Conference provides a great opportunity for local area professionals and students to present their work at this technical forum with a minimum financial and time burden. Dual Conference is organized by Clear Lake Council of Technical Societies (CLCTS), by IEEE Galveston Bay Section Society Chapters, and by the Robotics and Automation Technical Committee of AIAA Houston Section. STUDENTS’ POSTER SESSION AWARD: IEEE has instituted three awards (one $200, two $100) for best judged poster paper/presentation. Abstracts for the poster session need to be emailed by Friday Oct 4th to Dr Paul Frenger (pfrenger@alumni.rice.edu). Number of posters will be limited to 15. Full day program which includes luncheon is $20.00, Conference ONLY $15, Additional Luncheon tickets $10.00, All attendees to pay. All registrants will be provided final program. Registration fee will be due at the event. All No SHOW registrants will be billed. For additional inquiries please send emails to any of the above co-chairs. The AIAA Houston Section is encouraging members to participate in the EcoBot Challenge. The EcoBot Challenge is for 5th-8th graders in 4-person student teams to design, build and program autonomous robots to accomplish 4 missions on a competition table. The event will be held at Reliant Center Hall E and needs setup volunteers May 16th and varying types of volunteers on May 17th. You can find out more on the website below or go directly to sign up here. 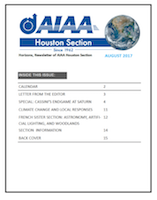 If you sign up, please be sure to put down “AIAA Houston” as the organization you are representing and also let us know you will be attending by selecting the “Free Ticket” below. Thank you in advance for inspiring the next generation and giving them a great learning experience!